Pesto is a quick, easy summer dish. The best-known type of pesto in this country is pesto genovese, featuring fresh basil, pine nuts, garlic, olive oil and Parmigiano Reggiano. But that is just the beginning. I usually have no idea what I will be cooking when I get to market, but after I get home and see what I have purchased, a plan comes together. Backward design, you might call it. This week’s rearview inspiration was pesto. At market I couldn’t resist the beautiful, oh-so-fresh small bundles of basil and parsley, fresh garlic and slender dark purple Japanese eggplants. Pesto is the perfect summer dish. It’s quick and easy, and many types don’t even involve turning on the stove. The name pesto comes from the Italian word pestare, meaning to pound or crush. Long before there were food processors, it was made by crushing the ingredients together in a mortar and pestle. The best-known type of pesto in this country is pesto genovese, the traditional bright green pesto from Genoa, Italy, made with fresh basil, pine nuts, garlic, olive oil and Parmigaino Reggiano. But that is just the beginning of a full pesto repertoire. In Italy, pesto changes with the region, each taking advantage of local ingredients. Some use sun-dried tomatoes, others fresh cherry tomatoes, some anchovies. The southern Italian Calabrian pesto that I made uses onion, red pepper, eggplant and tomato. 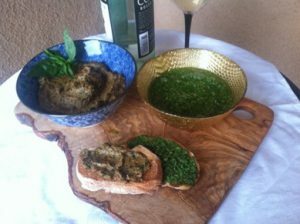 Then there is Mexican-inspired pesto made with pepitas and cilantro, pesto made with garlic scapes, pesto made with arugula and so on. Suffice it to say, pesto has infinite versatility — both in its composition and its use. Once you make a batch, you can store it in the refrigerator and use it in many ways over the course of the week. It also stores well in the freezer. Spread it on hot or cold sandwiches — anything from turkey sandwiches to grilled cheese (don’t forgot those going in the panini machine!). Top grilled chicken breasts, fish or other meats with it. Mix it with a little ricotta or goat cheese, and use it as a stuffing for chicken breasts or pork chops. Add flavor to vegetarian or egg dishes — try stirring a spoonful into sautéed vegetables or a frittata. Mix it with Greek yogurt to make a healthy dip for vegetables or chips. Spread it on homemade pizza dough as an alternative to tomato sauce. Spread it on toasted country bread or crostini for a healthy snack. One nice factor about adding ingredients like tomato into a pesto is that instead of only relying on oil to get the right consistency, adding fresh tomatoes makes the pesto a little looser and adds volume, thereby cutting down the amount of oil (and fat and calories) needed. I’m a sucker for versatile foods like pesto that give the cook a lot of room for improvisation. You don’t have pine nuts? Try almonds or sunflower seeds. You don’t like anchovies? Try olives. You want it more flavorful? Add extra garlic or red pepper. And this time of year at your local growers market, your choice of ingredients to put in or serve alongside your pesto is astounding. Just when it felt like we might all dry up and blow away, the July rains brought much needed relief, encouraging the crops to burst through like a late afternoon rainbow. This month look for red, blue and gold potatoes; green and purple string beans; dark purple and ghost white eggplants; ruby red and golden beets; brilliant orange carrots; verdant lettuce mixes and chard; pale green fennel, bright herbs, and of course super fresh cheese, eggs, bread, jellies, meats, and more. Deciding what to buy won’t be easy, but with a little bit of backward design, whatever you bring home just might become your next favorite meal.